Sun Tzu’s ancient Chinese text, The Art Of War has been praised for its applications to warfare ever since the old general first scribbled his thoughts on strips of bamboo more than two thousand years ago. The text is as much about avoiding war as it is fighting it, and its timeless wisdom has kept it on the nightstands of many generals, right next to the Bible. It is on the Commandant’s Reading List for the United States Marine Corps. Douglas MacArthur is known to have studied Sun Tzu, and The Art of War is required reading for officers of the Central Intelligence Agency. The thirteenth and final chapter of The Art Of War is all about spies. As Sun Tzu points out (and every military commander will tell you) that there is no substitute for knowing as much about your enemy as possible. Just as vital, perhaps even more so, is the importance of preventing your enemy from learning too much about you. In the real life cloak and dagger world of State Intelligence, keeping information out of enemy hands is the job of Counter Intelligence Agents. 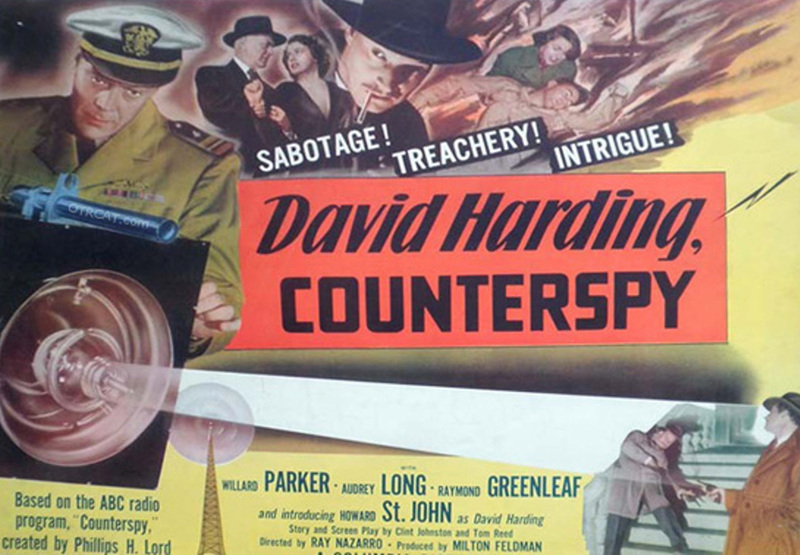 From 1942 until 1950 on the radio, the job defeating enemy spies fell to David Harding, Counterspy. Counterspy was the creation of one of radio’s most prolific producers, Phillips H. Lord. Lord is best known for the long running police drama, Gangbusters, but his contributions to radio are similar in scope to Himan Brown, Frederick Ziv, and the Hummerts. Lord invested personal attention to every element of his programs, and by the late 40’s there were as many as 18 Lord productions airing on three different networks. The country, still recovering from the sneak attack on Pearl Harbor, was ripe for a show like Counterspy in 1942. The show incorporated the respect for law and order which was vital to Gangbusters along with a patriotic sensibility demonstrated in Lord’s We The People. The overriding theme of Counterspy was that no matter how sneaky, underhanded, ruthless, or downright evil the enemies of Democracy were, they were no match for the All-American agents of the Counterspies. David Harding, Counterspy was unique in the annals of Espionage Radio Fiction because its star character was a spymaster rather than simply a field agent facing danger every day. Harding, played by Don MacLaughlin, was the head of the fictional Counterspy organization. While both shows were on the air, MacLaughlin also played Commissioner Valentine on Lord’s Gangbusters. A clean cut Iowa native, MacLaughlin appeared on Broadway, and several Radio Soaps. Reviewers claimed he had “the most American voice on the air”. Being a spymaster allowed Harding to possess a great deal of knowledge which his cohorts may not have been privy to, but Harding was far from being a desk-bound bureaucrat. He was an accomplished field agent in his own right, willing to go where ever there were military secrets in danger.